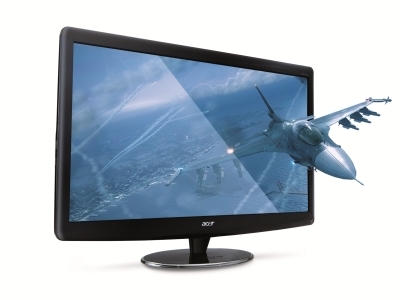 Acer has revealed the worlds first 27″ Display featuring Full High Definition support for Nvidia 3D Vision Technology. The Acer HN274H would feature a max resolution of 1920×1080 (HD) and a contrast ratio of 100,000,000:1 along with a LED Backlit panel adding a 120Hz Refresh Rate. The monitor will come with a 2ms response time. Including technologies like eColor and Adaptive Contrast Management, The display would allow for Ultra Sharp and view Realistic images on the huge 27 inches screen. The Display would be aimed towards gaming and video enthusiasts as 3D would make Movie Watching and Gaming alot better. The Display would be available in May at an SRP of £499, including VAT. It’ll come bundled with a built-in IR emitter and a pair of Nvidia 3D Glasses.